The Chinese Jian (or Ken sword) is known for its trademark double-edged blade and spear point. 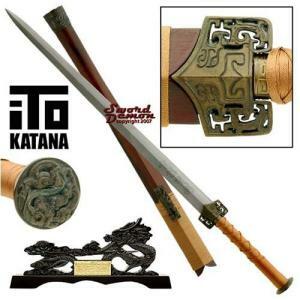 It's heavily used in Chinese martial arts, and if you're looking for a choice prize to award at your next match, this ITO Katana may be a good choice. The Jian is fully forged, and is made from high carbon steel, which means if you ever had to use it, you could. The decorative features are the eye-catching part of this Jian, though. Engraved on the blade itself you'll find a warrior dragon, as well as beautiful kanji script. Does anyone know what it reads? The tsuba and pommel are both made from solid pieces of antiqued metal, engraved in traditional Chinese designs. The scabbard's large kurikata (knob) has also been polished and decorated to match the metal on the sword. You'll be pleasantly surprised by all the extra stuff you get with it as well. The Jian comes with a beautiful wooden dragon stand to display it on, a cleaning kit to keep it looking brand new, and a lined gift box that also makes a safe carrying case. Not a bad deal!